Great international 1 sheet poster, the likes of which we never see these days. It's time friends once again for another, hopefully fascinating, retrospective journey into the wonderful world of the handmade special effect. Today we will examine the remarkable Oscar nominated effects work from Steven Spielberg's somewhat maligned, though undeniably spectacular 1979 epic, 1941. Despite it's many flaws - not the least of which was a seemingly freewheeling, out of control, all or nothing overindulgence - the film remains a treat for all fans of old school trick work, a dizzying array of on set mechanical and stunt gags, vast full scale physical effects and jaw dropping miniature set pieces, the likes of which we hadn't seen on the theatre screen in decades, and certainly not on such a massive scale. I worked for the New Zealand film distributor of 1941 at the time and I clearly recall the film's campaign and splash release which, despite high expectations failed quite miserably at the box office and just couldn't find an audience. I recall it was a major flop worldwide on initial release though I believe it found a dedicated audience decades later at revival houses and on DVD and recently on a sparkling BluRay edition. 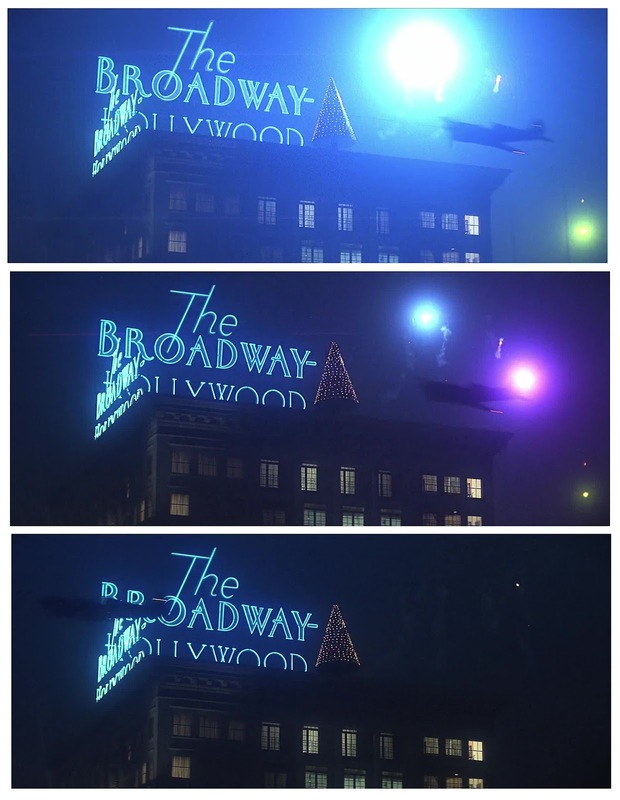 The pivotal Hollywood Boulevard dogfight sequence remains as eye popping a sequence today as it did when I saw it at an advanced preview months prior to theatrical release back in the day. Star John Belushi in one his more lucid moments. 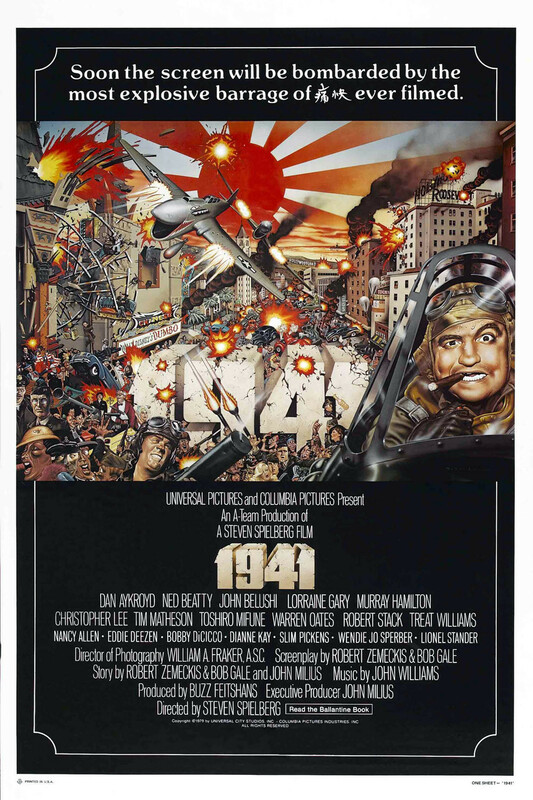 So, as an event film, before event films became commonplace, 1941 very much invokes the flavour of films such as IT'S A MAD, MAD, MAD, MAD WORLD (1963) with hit or miss mixed results. John Milius is a film maker and screenwriter I much admire (whose various interviews and commentaries over the years are always well worth paying attention to), and with co-writers Bob Gale and Robert Zemeckis concocted a wild, rollercoaster ride of noisy slapstick mayhem - perhaps too much so - all very loosely based upon an apparent actual incident in Los Angeles where a mild state of panic may have ensued when reports of possible or imagined sightings of Japanese off the Californian coastline. 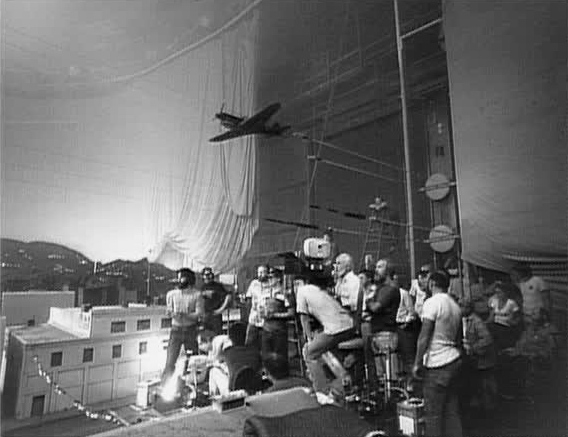 Director Steven Spielberg assembled a large crew and commenced pre-production as far back as 1977 right after CLOSE ENCOUNTERS OF THE 3rd KIND. With the vast and worthy success of JAWS, the director was afforded an open door (and cheque book) to whatever project his heart desired. Amid the large cast were a number of standouts, often amongst the lesser known players, especially the vastly under rated Treat Williams - so brilliant in Sidney Lumet's corrupt cop masterpiece PRINCE OF THE CITY (1982). Bobby Di Cicco, Dianne Kay, Nancy Allen and Tim Matheson also shine amid veterans such as Robert Stack, Slim Pickens and the great Warren Oates. The film isn't especially funny, sadly. 1941 is of the school that thinks the louder it is the funnier it is.... Not so. 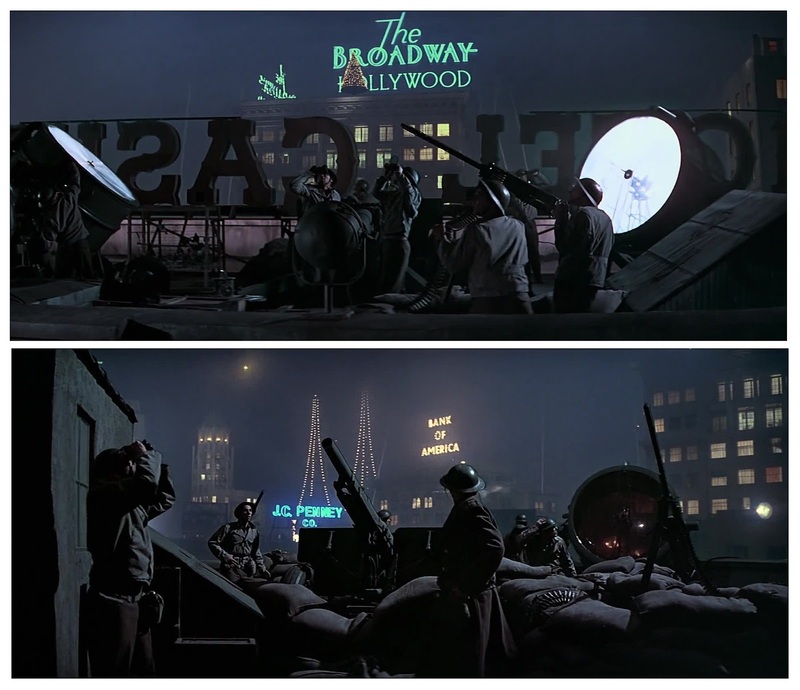 While it's certainly entertaining (though the extended BluRay edition just goes on a might too long) I found enormous appeal in a few of the least likely of places, such as the wonderfully choreographed dishwashing sequence near the start in Dub Taylor's diner kitchen; the table top Gene Kelly routine with a cleverly utilised dance/stunt double substituting a principal player at key moments in a tremendous routine - and all in one uninterrupted take - and also I loved the extended Jitterbug sequence in the USO club. Terrific stuff that almost made me forget about the eternally irritating Eddie Deezen. 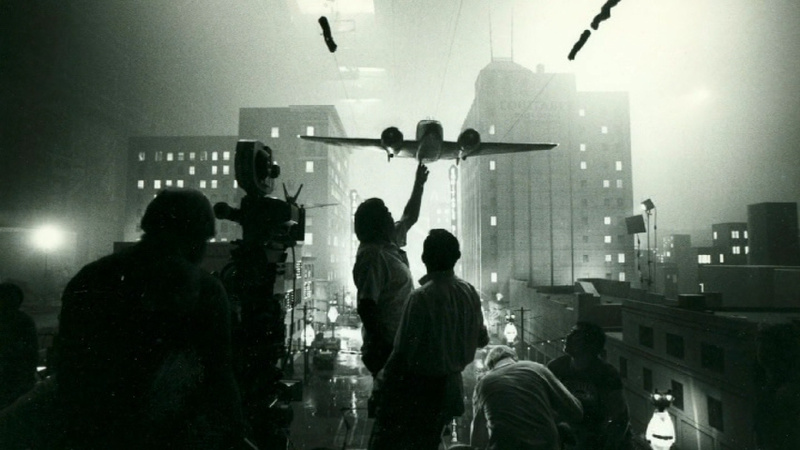 As a special effects film, 1941 has much to discuss. 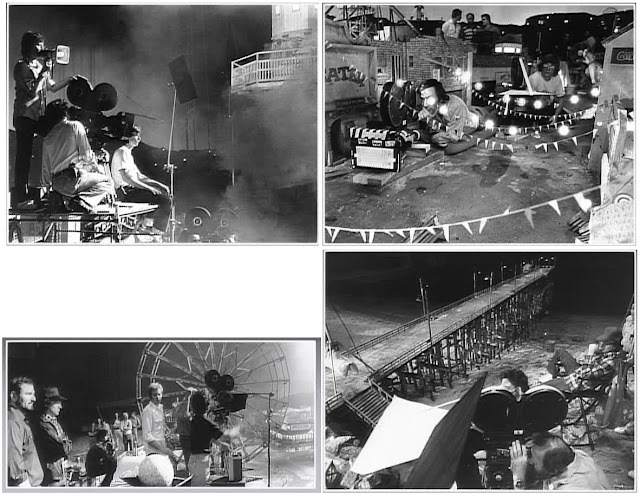 Very early on in the process, Spielberg engaged key effects personnel to design and construct the quite massive roster of special requirements - both full scale and miniaturised - for a number of important set pieces in the film. 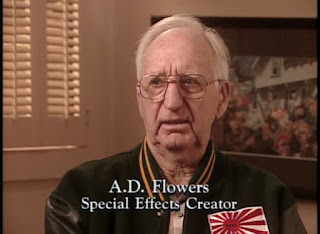 Key to that end was long time industry veteran mechanical effects expert A.D Flowers, one of Hollywood's most highly regarded men in his field. 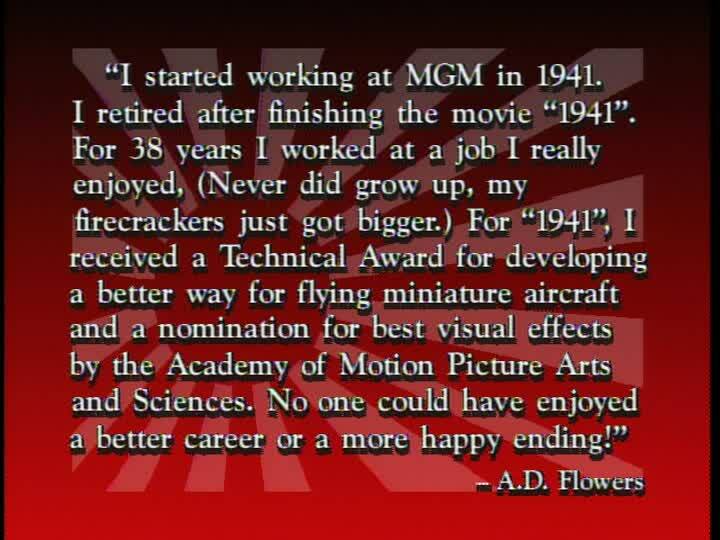 Flowers, who passed away in 2001, started his career at Metro Goldwyn Mayer in the late 1930's, working on films such as THE WIZARD OF OZ and many more. Flowers (whose full name I've never been able to uncover!) would become an important member of MGM legend A.Arnold Gillespie's special effects crew and assisted on the Oscar winning miniature and pyrotechnic work on such legendary films as the still excellent THIRTY SECONDS OVER TOKYO (1944), GREEN DOLPHIN STREET (1947) and FORBIDDEN PLANET (1956) to name but a few from the Golden Era. In his memoirs, Arnold 'Buddy' Gillespie wrote with much admiration of A.D's skills, knowhow and friendship. 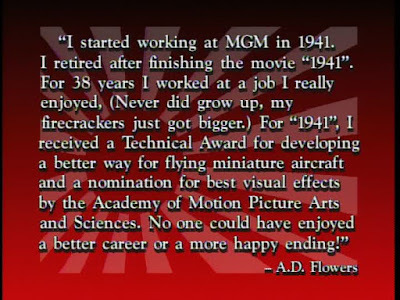 In his later years Flowers would provide outstanding mechanical effects work on shows such as THE TOWERING INFERNO (1974), the mind bogglingly immense project that was APOCALYPSE NOW (1979), and much creative bloodshed for the three GODFATHER pictures for Francis Coppola. Flowers, who often worked in collaboration with old time effects cameraman L.B 'Bill' Abbott, engineered some of his very finest work for TORA! TORA! TORA! (1970) which deservedly won him, and Abbott, each an Academy Award for best special effects. On 1941 Flowers worked closely Logan Frazee, with whom he had partnered with on THE TOWERING INFERNO a few years before. 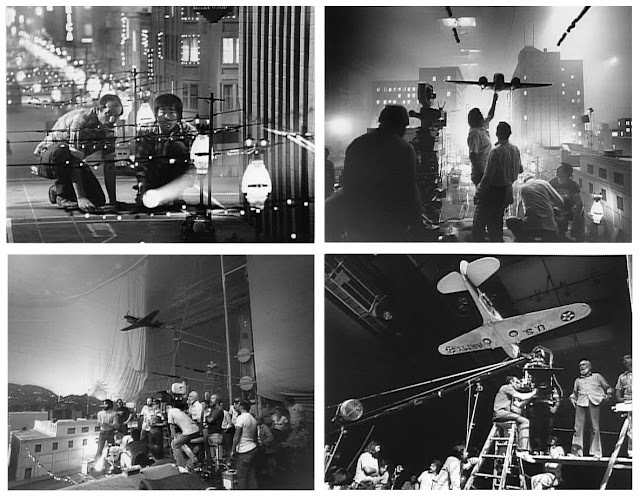 As a picture with such a large array of demolition and demands for larger than life action, director Spielberg immediately signed on one of his CLOSE ENCOUNTERS principal creative people, Greg Jein. 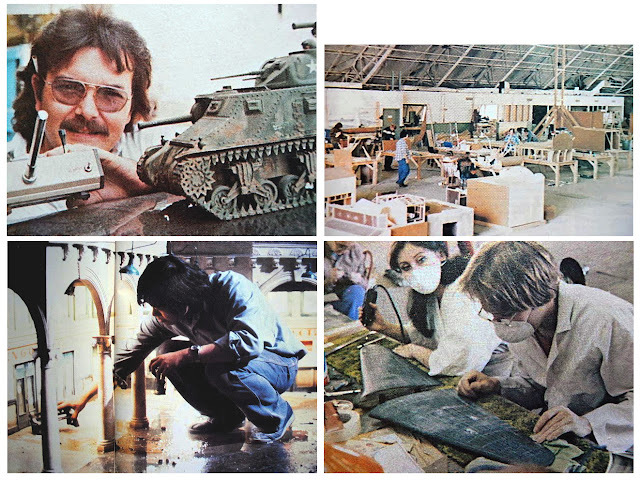 A highly sought after specialist in miniatures, Jein's career in movies began with spaceship model construction for the controversial FLESH GORDON (1974) and a few other small scale films such as John Carpenter-Dan O'Bannon's DARK STAR (1974). 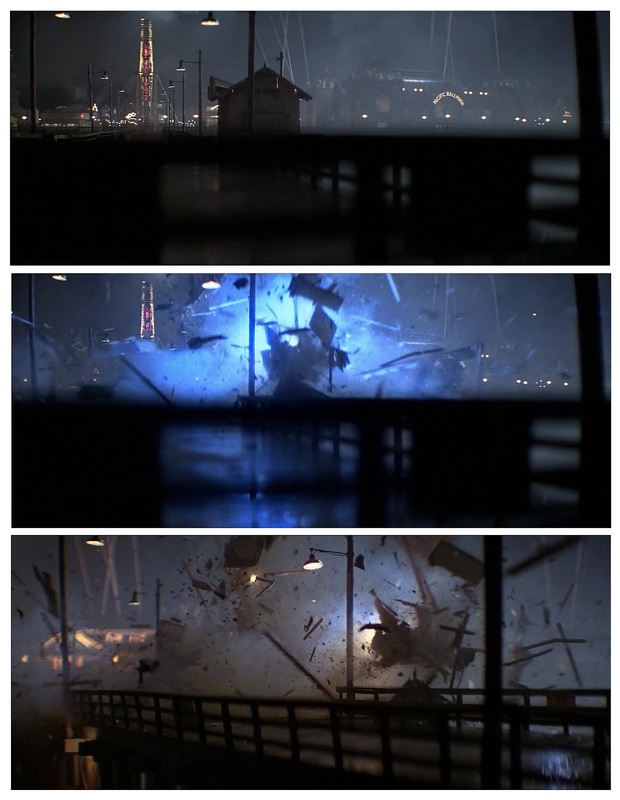 Greg would get assignments on numerous television shows and low budget flicks like LASERBLAST through the seventies which culminated in his getting the gig of his life, CLOSE ENCOUNTERS OF THE 3rd KIND (1977). 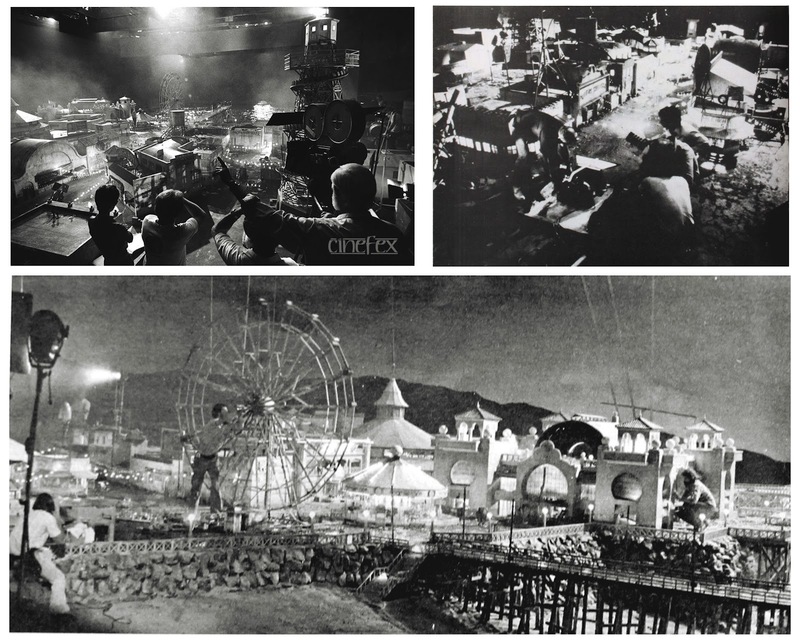 1941 would be a huge production in every respect, with Greg's miniatures department kept extremely busy building scale model sets of Hollywood Boulevard, an ocean side amusement park and a variety of airplanes, a submarine and a radio controlled tank. Greg was a great admirer of the legendary Lydecker brothers, Howard and Theodore, who for many years had engineered astonishing miniature gags and effects shots that on screen far exceeded the modest at best budgets the brothers were repeatedly stuck with at Republic Pictures. Absolute masters when it came to 'flying' miniature aircraft convincingly through actual outdoors skies, Howard and Theo's methods would be adapted and utilised by many subsequent practitioners over the years whose appreciation of the brothers techniques would lead to those in the industry the oft used descriptive term "to Lydecker a model" as a means to propel or 'fly' a model along usually three fine cables stretched across a set. 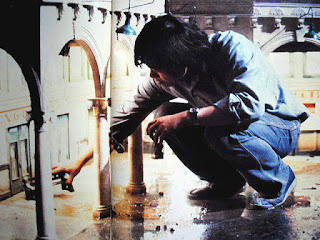 Jein, with A.D Flowers, would extensively resort to this time honoured yet utterly reliable modus operandi on the shoot. Another prime contributor to the effects output on 1941 was the aforementioned L.B 'Bill' Abbott, ASC. 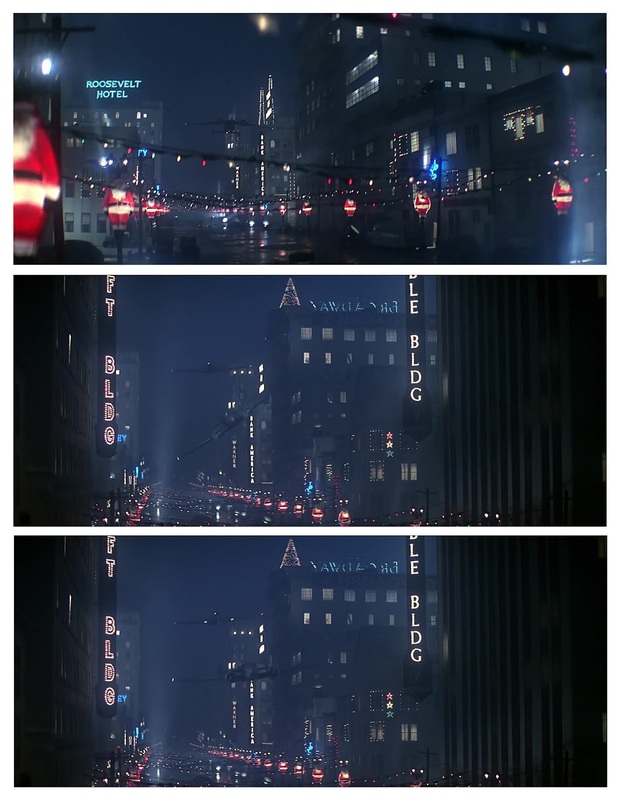 Bill's career in trick work spans back several decades where, mostly at 20th Century Fox, Abbott was one of Fred Sersen and then Ray Kellogg's chief visual effects cinematographers. 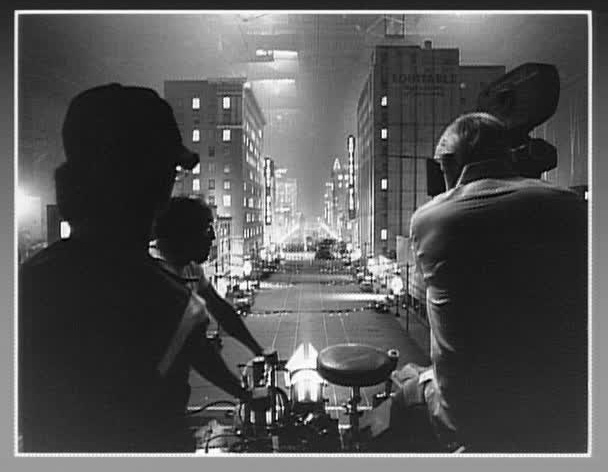 Abbott was a jack of all trades in the field, with expertise in model work, cameraman and optical effects on hundreds of films and television shows, with 1941 being his last major assignment. 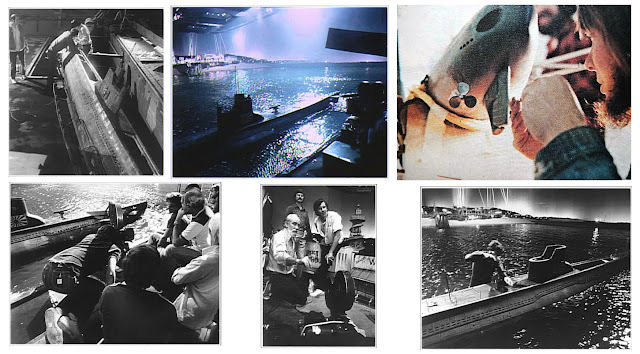 Through many years of experience Bill was an expert in model ships and 'miniaturised' sea effects sequences. He developed ingenious ways in which banks of small fans could create just the right amount of believable wave action in a model tank shoot, which along with special chemical additives and colouring agents could alter the 'weight' of the water - no mean task when shooting miniature ships and so forth. 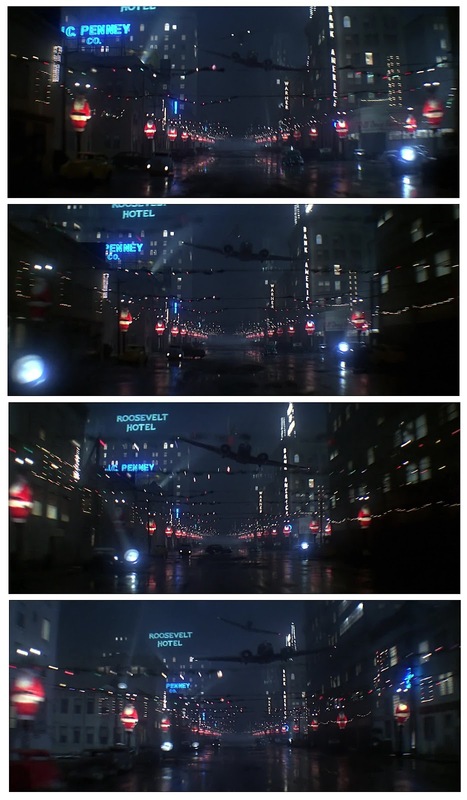 Abbott's ability as a visual fx cinematographer lent a polish to scores of films over his long career. For 1941, the director hired Bill Abbott primarily as a visual effects consultant and to oversee the few optical effects shots. Abbott's former assistant, Larry Robinson was tasked with overall special visual effects supervision. 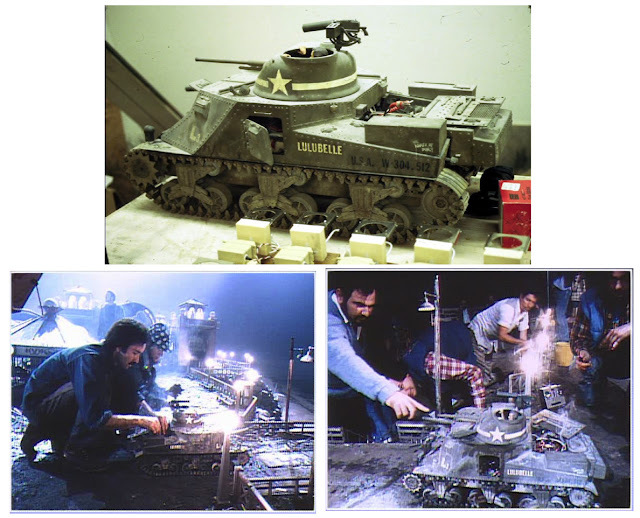 Unusually, on this production it was the principal Director of Photography, William Fraker, who would be enlisted to shoot both the main unit and the miniatures unit material rather than have a specialist cinematographer handle all of the model requirements. 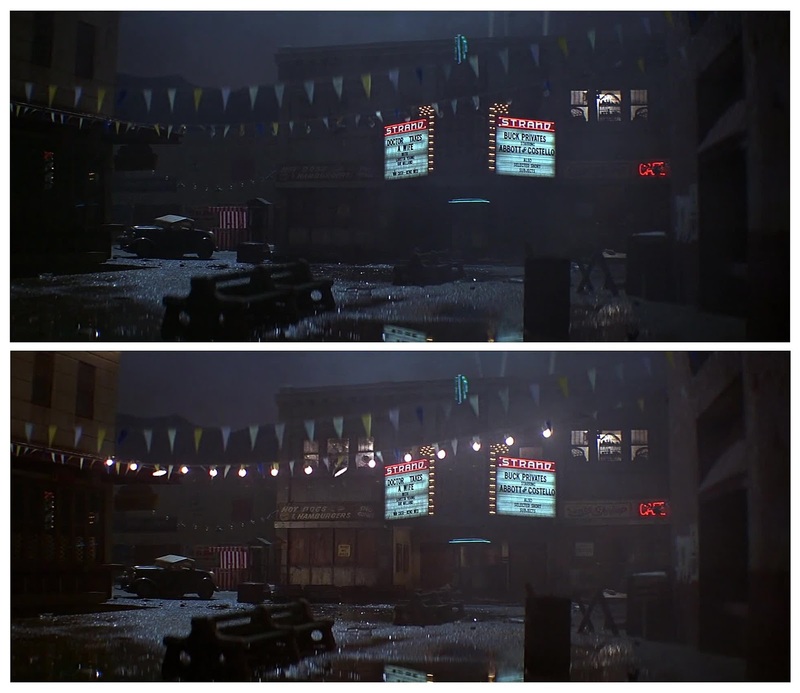 Oddly, as this blog is primarily concerned with matte painted shots the film discussed today has few, with only one confirmed matte and a couple of other possibles. Matthew Yuricich was matte artist on the show, with long time MGM effects cameraman James Liles also on board. As best as I can make out the ocean amusement park seen at the start is certainly a Yuricich shot, with maybe a couple of later wide night views over the San Fernando Valley possibly being painted as well. 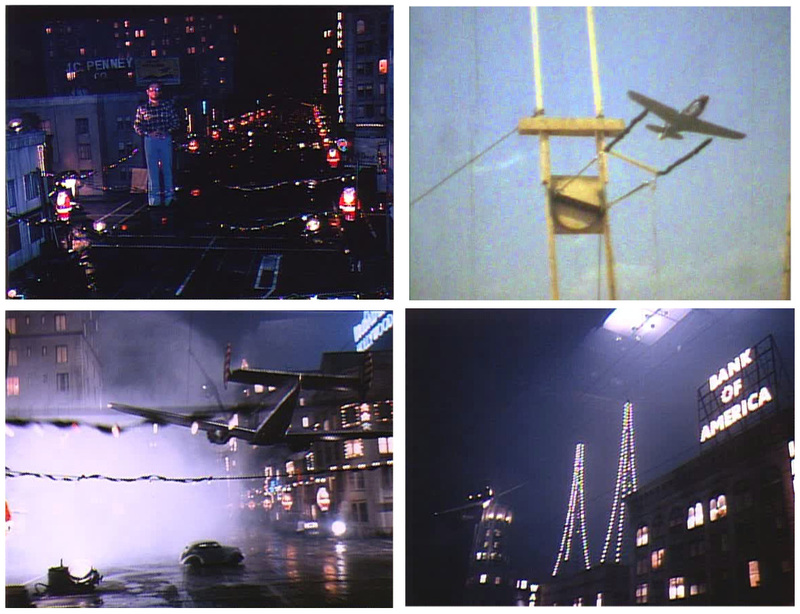 The film was one of five up for the Best Visual Effects Oscar that year, with the others being STAR TREK (great V'ger cloud effects design and execution), ALIEN (a class act all the way with less is more proving the key), THE BLACK HOLE (some good matte art and models) and MOONRAKER (great o/neg Meddings miniatures of shuttle lift offs etc). All had their strong points with ALIEN being not just the best movie out of the bunch by a long shot, but also collecting the SFX Oscar. 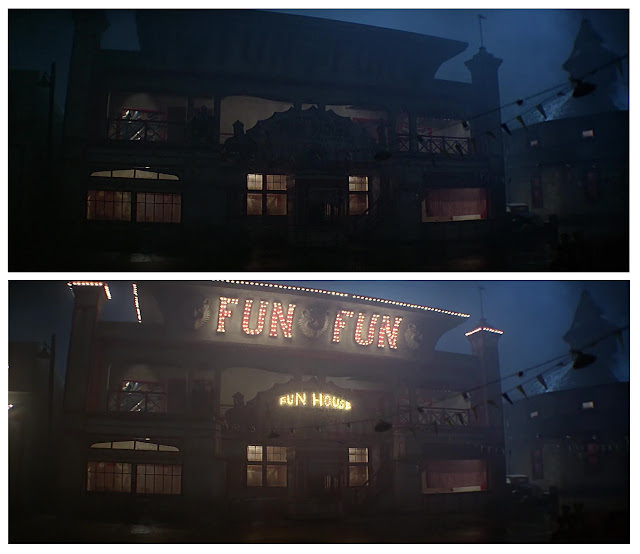 The first effects shot is this Matthew Yuricich matte which adds in the amusement park. Miniature amusement park from several vantage points. Director Steven Spielberg, seen at lower right, seems happy with Greg Jein's 'playland'. Referring to DOP William Fraker, Greg Jein said: "Bill kept telling us 'let the miniature light itself'. 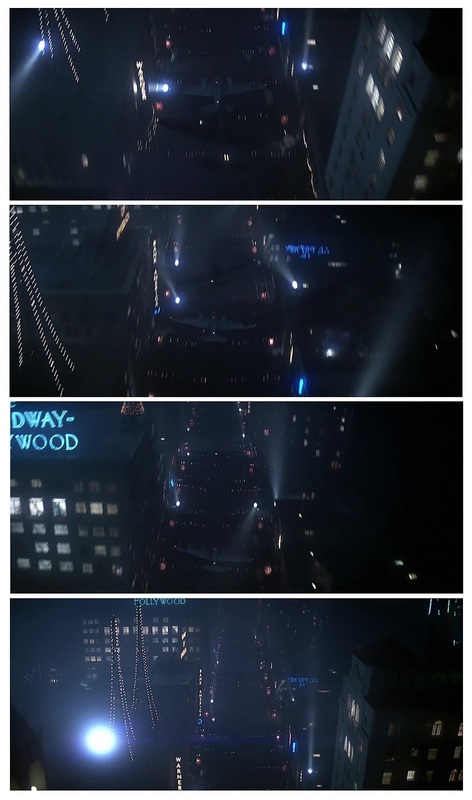 So we built in as many miniature light sources as we could find on the actual buildings and just took it from there, making it come to life." Amusement park set up and shoot. Wild Bill Kelso's P40 above Los Angeles. A neat shot with a great camera move following the P40. Possibly an in camera 'Lydecker' shot on horizontal wires or else an optically added P40. Very clean shot. The San Fernando Valley with searchlights and zooming P40 fighter plane. A very large miniature set measuring some 120 x 60 feet. The Hollywoodland sign gets a blast from John Belushi - all miniature. 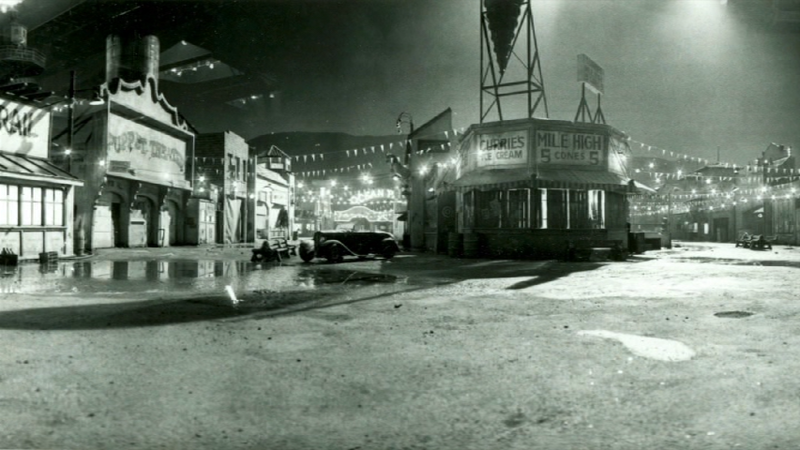 Hollywood Boulevard miniature set. Some 1000 cardboard boxes were purchased from which the model crew would cut hundreds of windows in them, decorate as required and illuminate from within. Some buildings stood as tall as 25 feet, with the first few blocks being consistent in scale while those more distant structures were built at a more forced perspective and with little or no detail as the camera wouldn't pick up with so much fast moving action occurring. 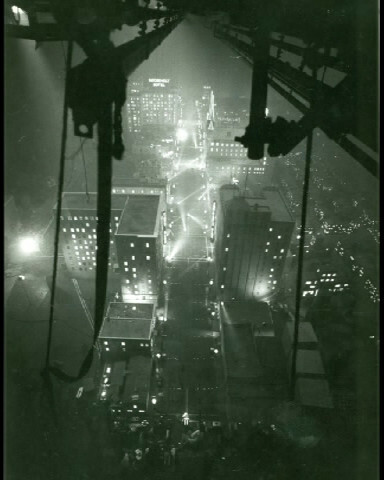 Construction of above set with miles of wiring under set to supply lights to all of the buildings and street signage. 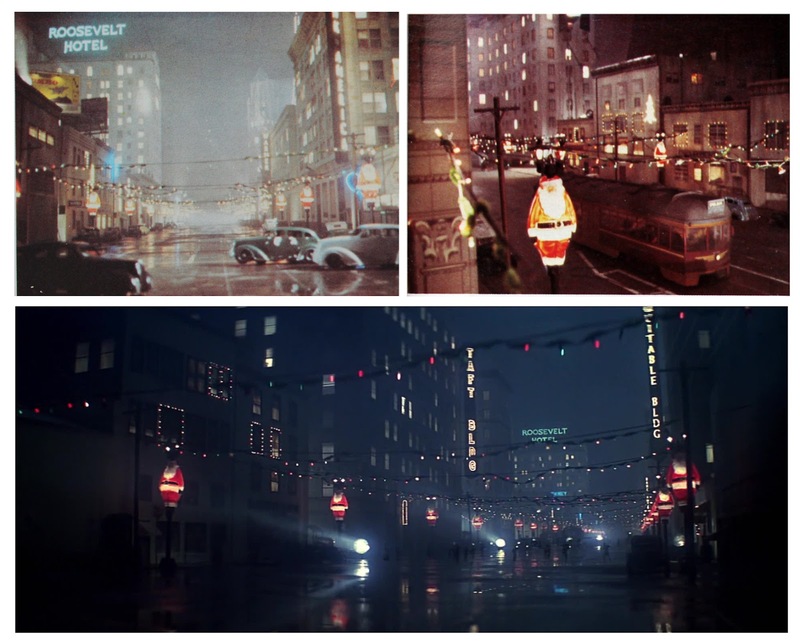 Robin Leyden and Larry Albright made the large numbers of special lights such as advertising signage and neon work which would compliment the set. 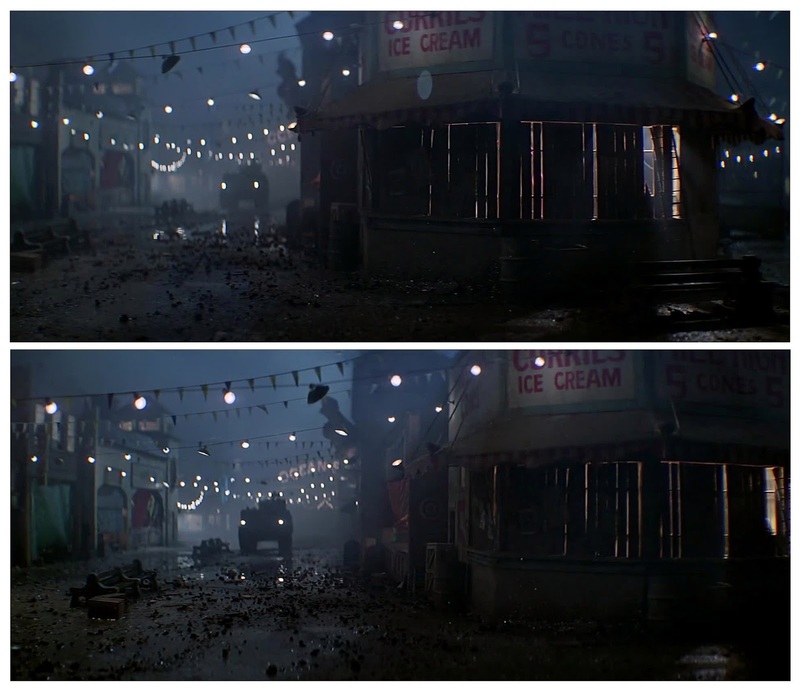 According to Greg Jein the internal lights had to be 'hot' enough to read on 35mm film, especially as cameraman Bill Fraker liked to use a great deal of smoke on the sets for diffusion. Thus, the models had to be constructed out of materials that would not burn up or smoke. 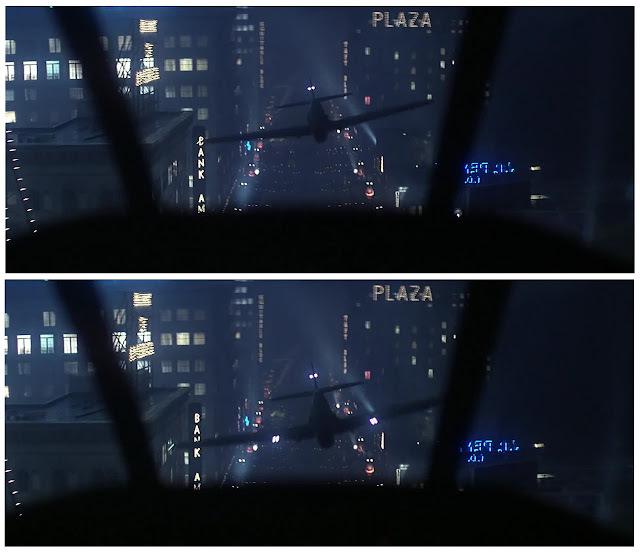 In these frames we can see the 'Lydecker' guide wires, along which Belushi's P40 is moving amid flak. 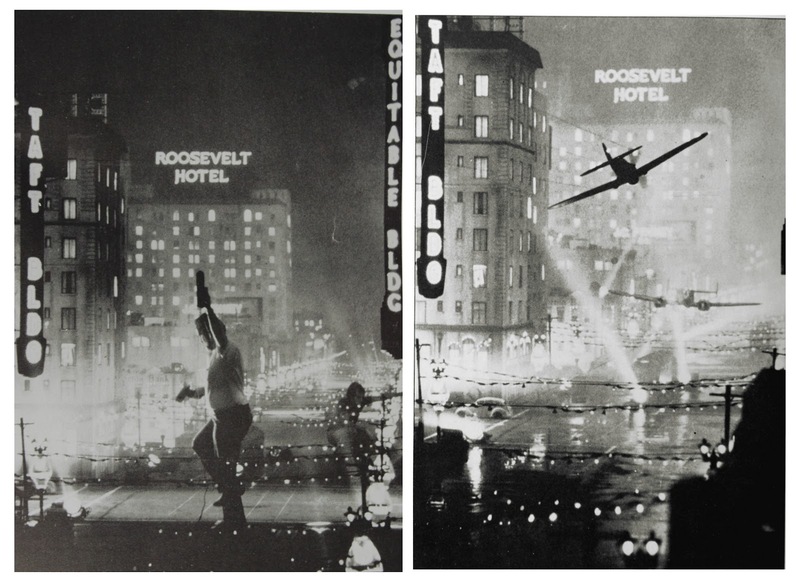 Behind the scenes views of the street set and the miniature flying rig (upper right), which in this example has been specially designed to allow complex barrel roll stunt maneuvers as the P40 roars above the busy boulevard. Both A.D Flowers and Logan Frazee were awarded a special scientific plaque by The Academy for their development and successful application of this device. 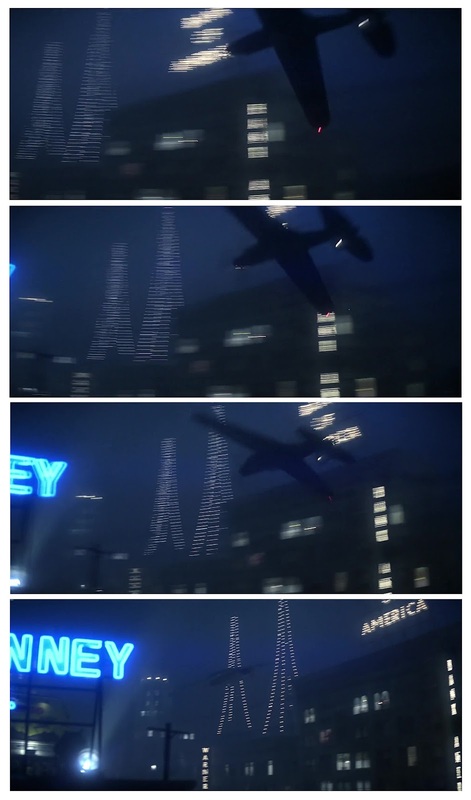 Frames from the P40 barrel roll gag which look fantastic on film. Flying upside down down the Boulevard. The sequence is astounding as we are treated to a number of angles - from above, below, side view etc and even a cockpit-eye view. A.D Flowers' effects assistants secure the P40 miniature on it's guide wires. The propeller was a battery controlled unit. This age old technique has been around for several decades, with similar applications being readily adapted by effects legends such as American exponents like John P. Fulton, Arnold Gillespie, Gordon Jennings, Donald Jahraus, Lawrence Butler and of course the Lydecker brothers as well as British model experts such as George Blackwell, Les Bowie and Roy Kellino. Some artistic licence was taken with this set with certain geographic and architectural landmarks being moved around to make for a more aesthetically pleasing composition. John Belushi's plane heads straight on toward Tim Matheson's aircraft in this wonderful pilot's eye view shot. Rigging the P40. 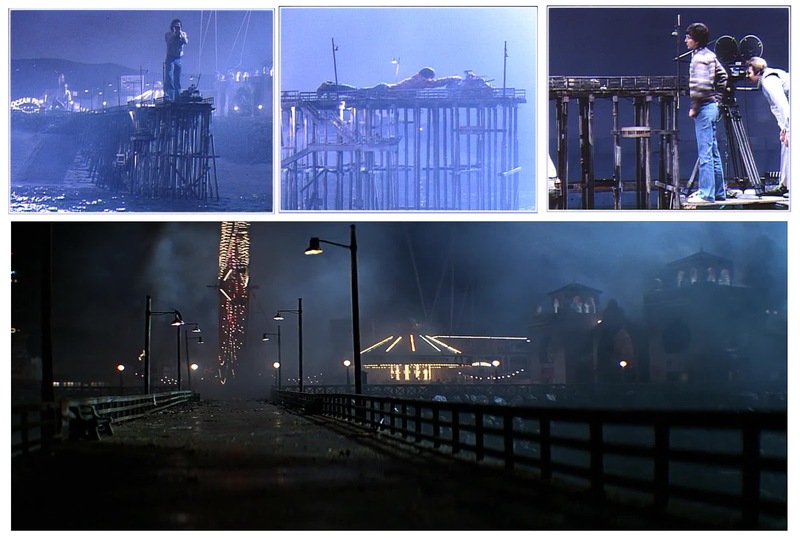 All of these shots were executed 'live', that is, in camera without any post production compositing. A few frames from a sensation high speed tracking shot as our POV races along Hollywood Blvd whilst keeping the pair of planes in frame as they try to outrun each other. The recently invented Louma Crane boom arm was used in shooting such sequences. Various street vehicles are also seen crossing intersections etc. A close view of the street level detail which was not planned and had to be prepared at the very last minute when Spielberg decided he wanted low level shots to flesh out the sequence. According to Greg Jein, his crew had to visit scores of drugstores to purchase a certain cheap toy car, from which the wheels would be pulled off and used on quickly assembled vacuum form model cars. Initial experiments with radio control were problematic as outside interference with radio signals caused havoc, so simple monofiliment fishing line was the next best option in manually pulling the cars along. Main unit D.O.P William Fraker (seen here at right) also served as miniatures unit cinematographer in order to ensure a smooth continuity of Fraker's much loved backlight and smokey haze between first the two units. 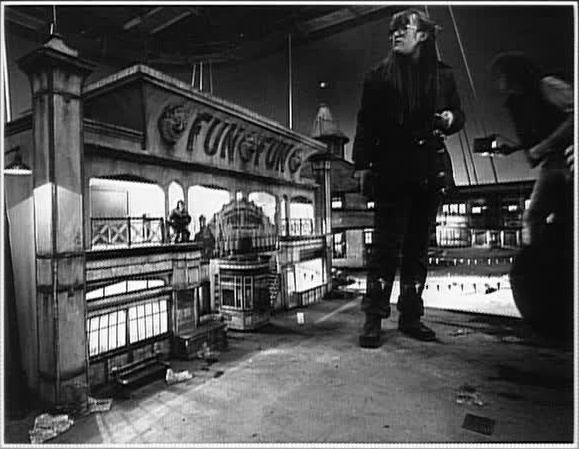 A technician cautiously steps around the intricate 'Lydecker' flying rig, which in the on set photo at right we can clearly see in use, though such rigs are never visible whatsoever in the final film. Typically, the planes had around a four foot wingspan and given the narrow margin for error in such a slender air corridor there were some unforeseen mishaps with midair collisions. Jein had other standby model planes at the ready for these events. 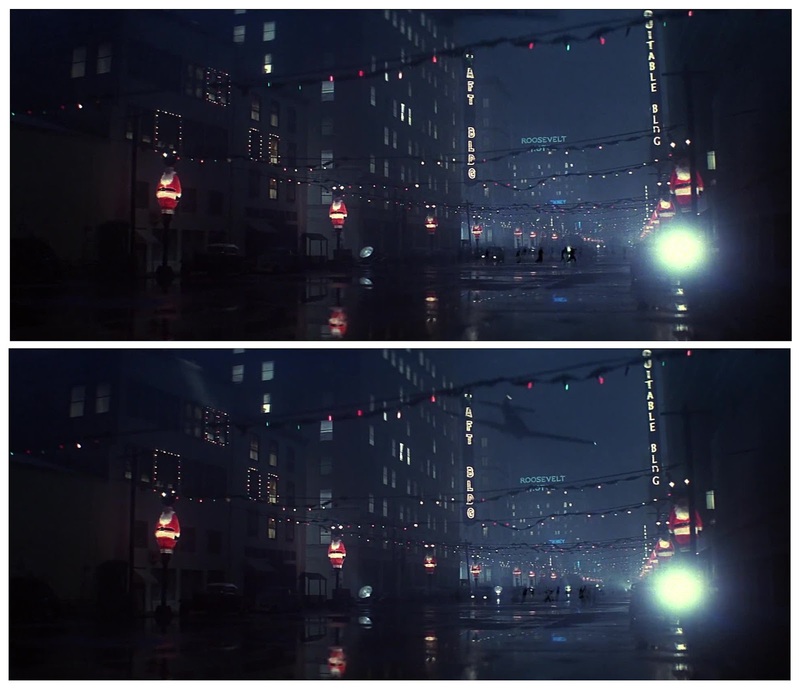 In this beautifully shot miniature street scene we have one of the few optical effects in 1941, with a group of people doubled in at street level running for their lives. It's barely noticeable but that little bit of action sells the shot. An overhead look from the top of the sound stage of the wonderful Hollywood Boulevard miniature set. Rooftop battery as planes swoop overhead which I assume to be a really clean blue screen composite. 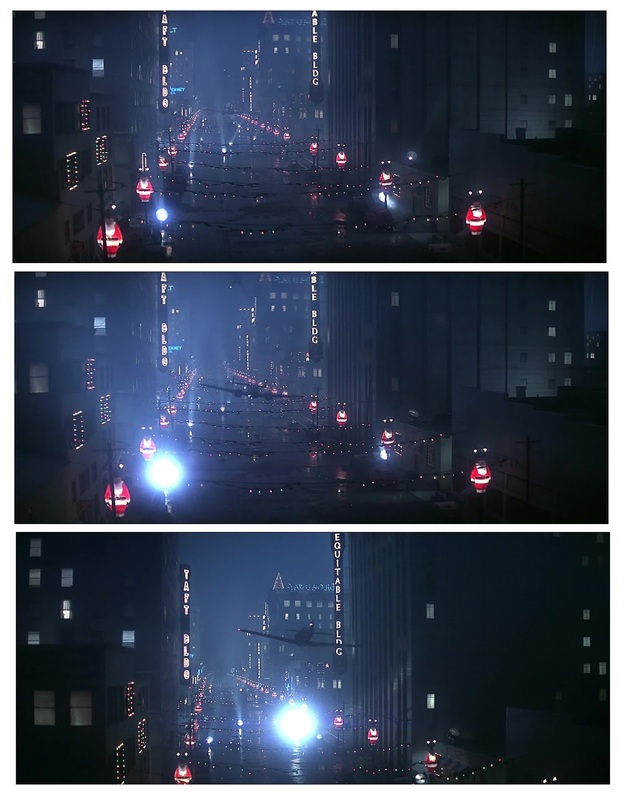 Due to the director's experiences and frustration in endless periods of waiting for opticals to be completed on CLOSE ENCOUNTERS - with sometimes up to one year between the photography and a final delivered shot, he chose to do as much as possible as in camera practical shots on 1941. Spielberg stated: "The picture has very few opticals in it, but they are very good. The work of Bill Abbott is excellent, as always, and we had to use some blue screen and that too is excellent. Larry Robinson coordinated it and put all of the different elements together through Frank Van Der Veer's lab. 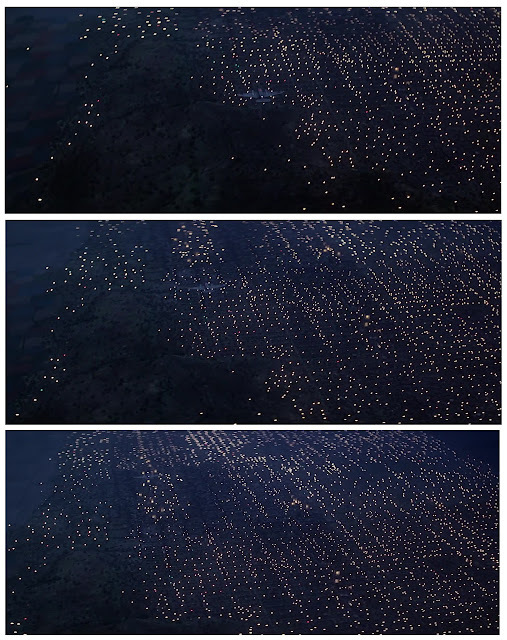 They did a wonderful job, but there aren't more than about 20 blue screen shots in the entire picture." That San Fernando Valley again, this time with flak bursts overhead as John Belushi flies through. Japanese sub surveys LA amusement park and takes decisive action... In one of the earlier takes of this shot, the miniature P40 flew straight into the Ferris Wheel at full speed. Fortunately replacements were at hand. 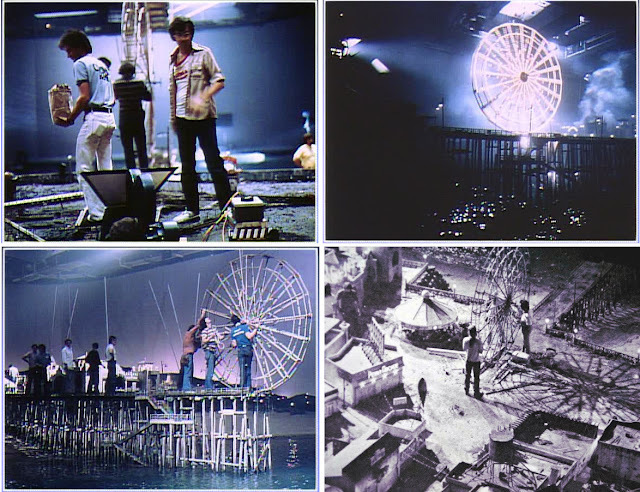 Construction of the Japanese submarine and filming in the old Esther Williams tank at MGM. The enemy slips into coastal waters. 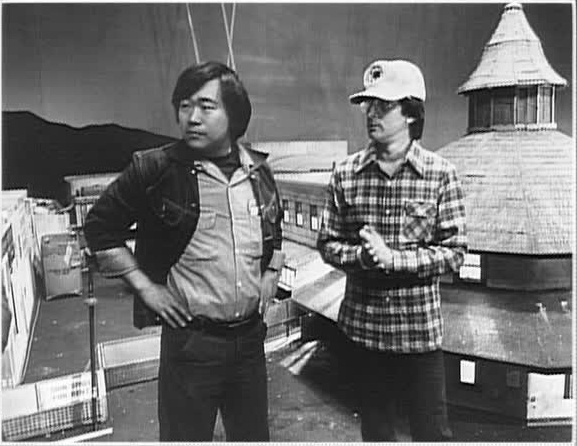 Jein and Spielberg survey the extensive amusement park miniature set. Ocean Park - the lights come on! Close view of the Ocean Park miniatures. 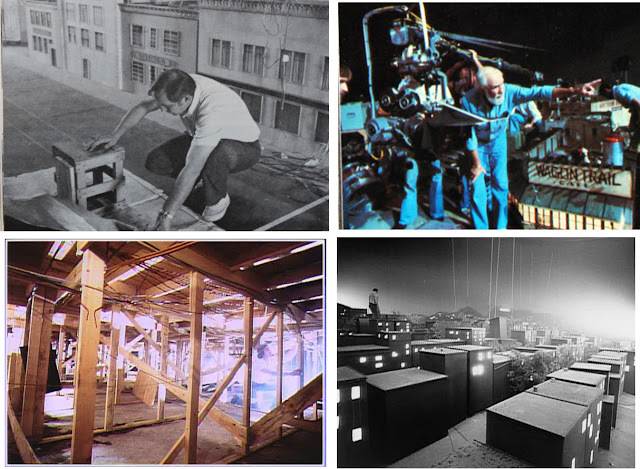 Lighting genius Larry Albright devised means to build tiny 4mm neon tubes which proved invaluable for both the Ocean Park as well as the Hollywood Blvd sets. Apparently some of the crew liked Larry's tiny neons so much they commissioned pieces from him for their homes. An artform all of it's own. 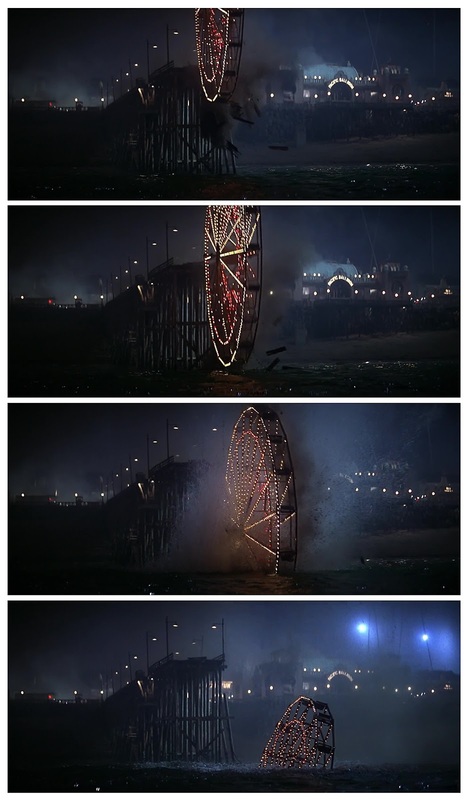 The mighty Ferris Wheel lights up. Larry Albright's micro neon wonderland. Ocean Park set with the Louma Crane which permitted camera movement not possible under normal circumstances. Said Spielberg in a 1979 interview: "I think that 1941 has the best miniature work since that of the Lydecker brothers in the forties and fifties. I don't know of any miniatures as authentic as the visuals seen in this film, and I'm not taking the credit for this. 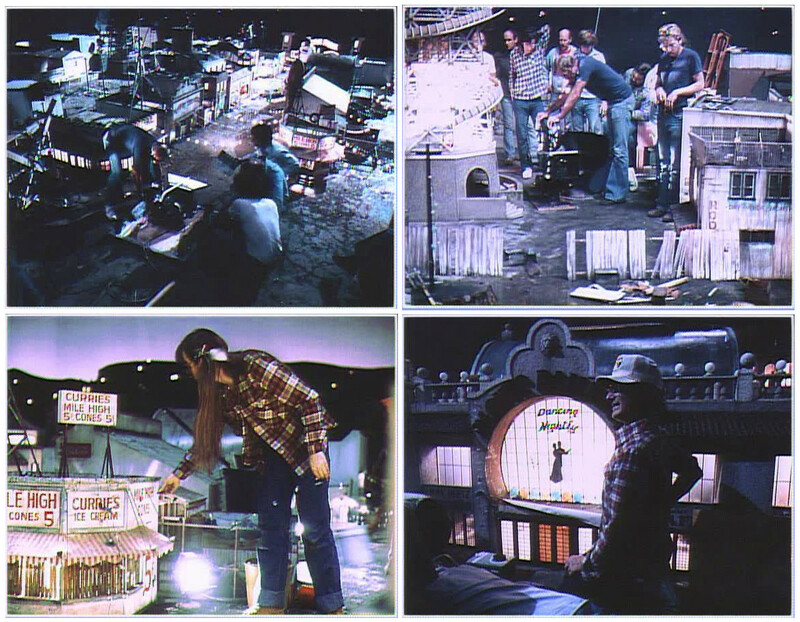 Most of the credit has to go to Greg Jein and his 40 miniature makers and electricians and painters who did a job, the likes of which hasn't been seen for 20 years in Hollywood." 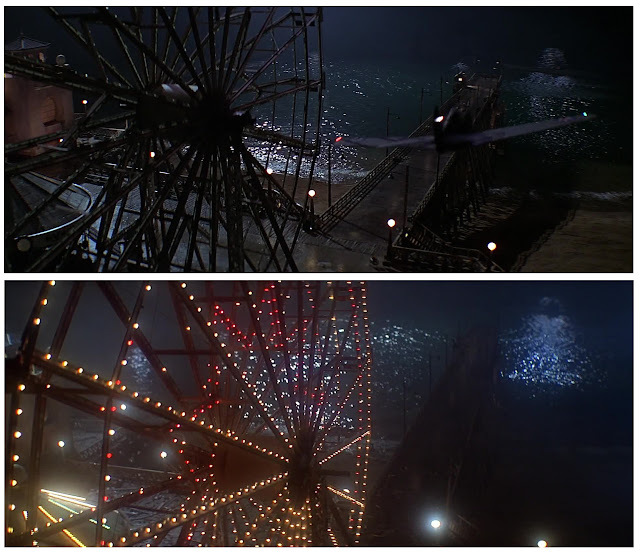 Spielberg lines up a shot for an elaborate sequence involving the Ocean Park pier and a runaway Ferris Wheel. 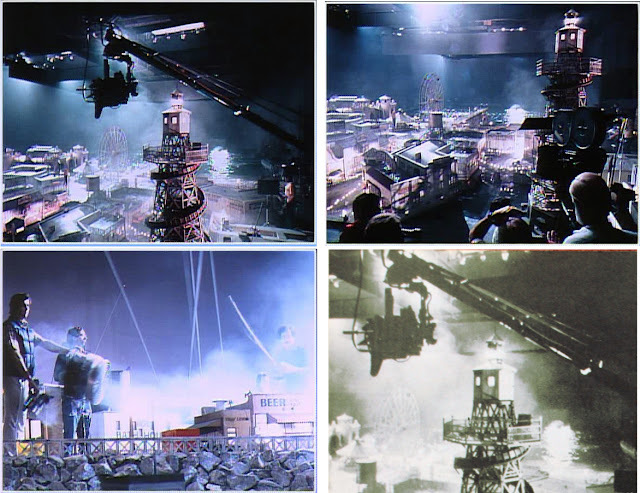 William Fraker's camera crew shooting various Ocean Park miniature set ups for the explosive climax. That appears to be John Milius standing next to Spielberg at lower left. Lulubelle the tank.... miniature set with remote controlled model tank. 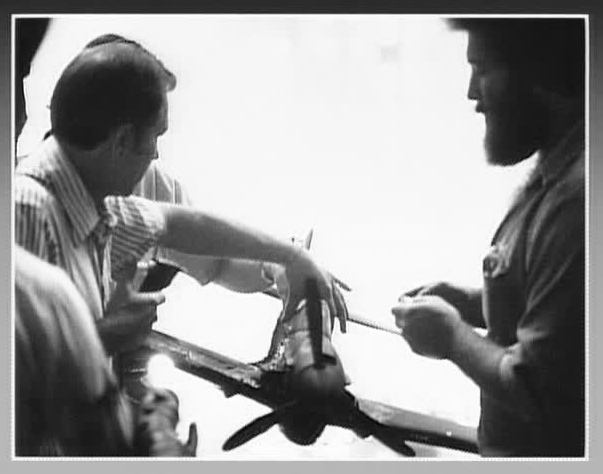 Ken Swenson (top left) with one of the miniature remote controlled Lulubelle's. 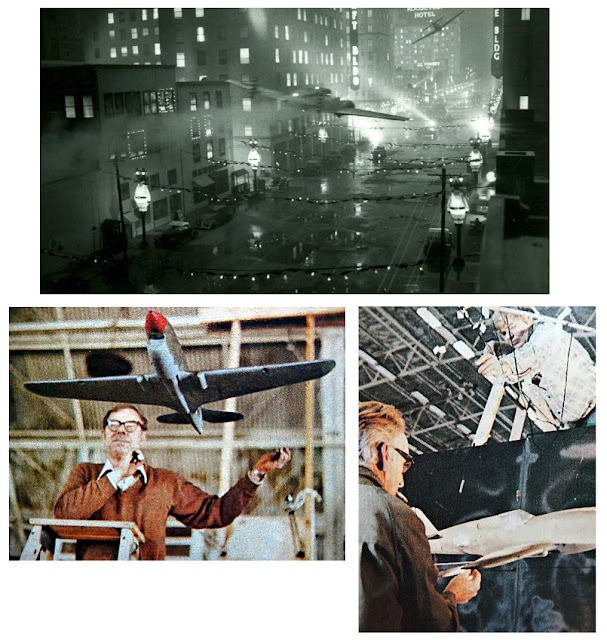 Also shown here is the still in construction Ocean Park set, Greg Jein applying finishing touches to part of an amusement arcade, and model makers at work on Wild Bill Kelso's P40 fighter. Lulubelle.... a toy for boys of all ages! Nice dolly shot across miniature set as Lulubelle arrives. On set photograph showing the craftsmanship and detail. The Ferris Wheel was rigged via a moving overhead dolly track to roll convincingly down the promenade. Small charges and pulley gags along the decking were used to destroy timber boardwalk etc. 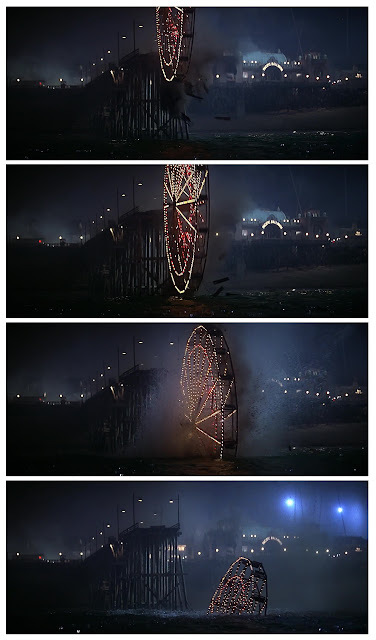 The entire wheel had to maintain full illumination of it's hundreds of small bulbs, even when submerged in the tank which was a tricky situation, both engineering wise and safety wise. 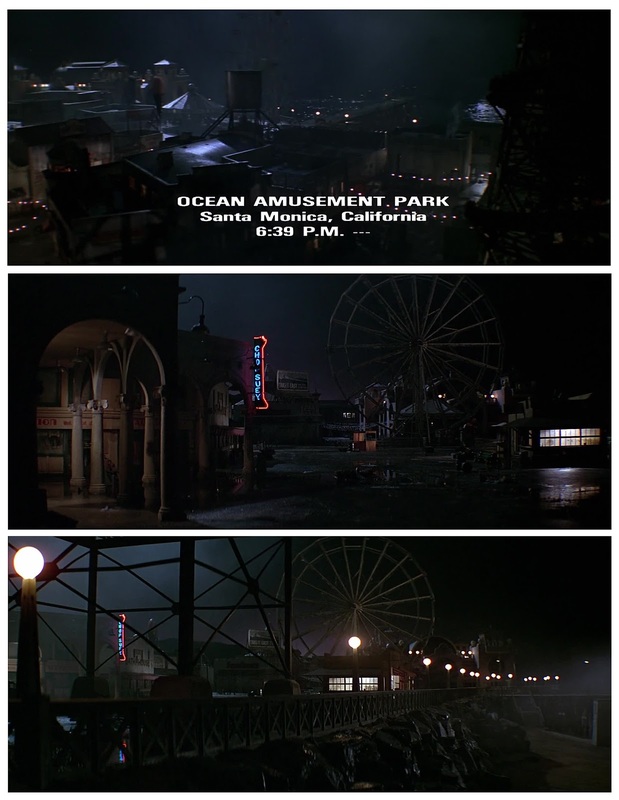 Specialist technical crews and engineers were employed on the Ocean Park set since the miniature park had a number of functioning rides. 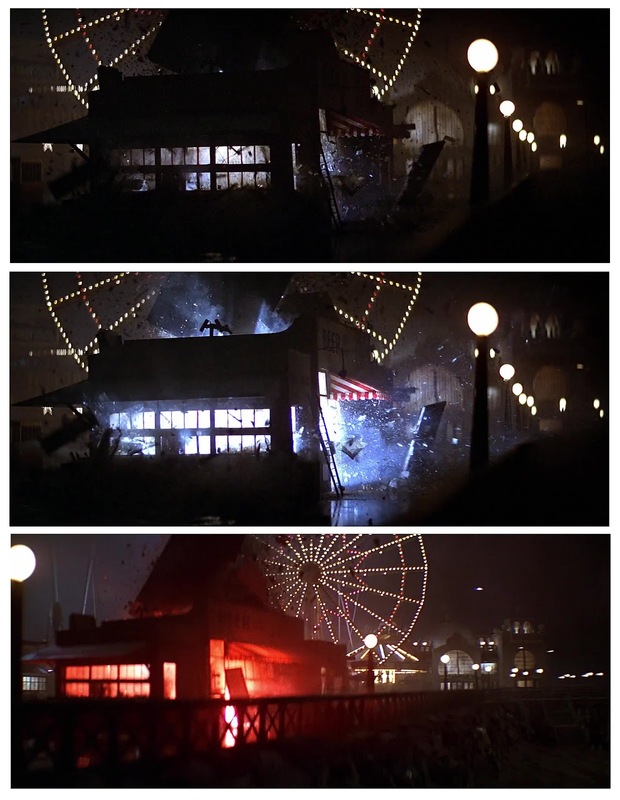 The Merry Go Round was originally written to be blown to pieces but Spielberg liked the model so much once he saw it operational he declared it much too good to wreck, so it was saved. 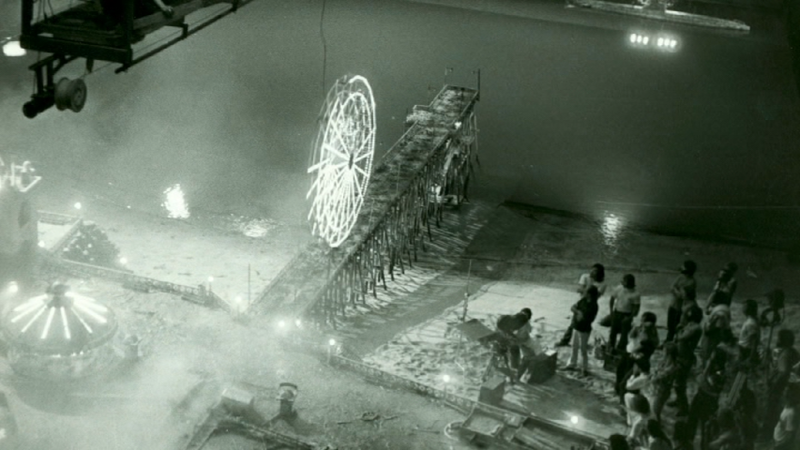 Ferris Wheel model rigged for action by Matt Sweeney's crew. 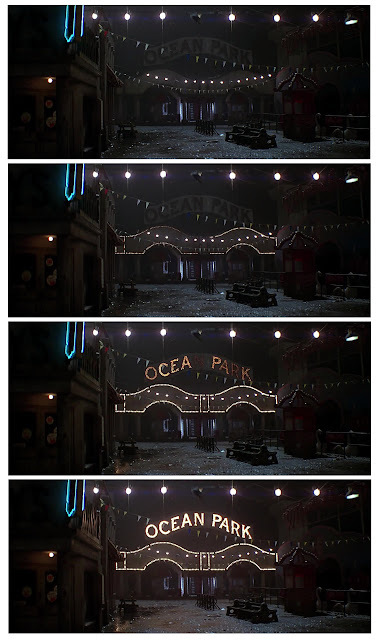 I'd hoped to see this thing blown up in the first reel, just so as I could be rid of that bloody annoying Eddie Deezen! Neat full miniature with racing motorcyclist. Not sure whether motorcycle is an in camera gag or a post production optical ... probably the former. 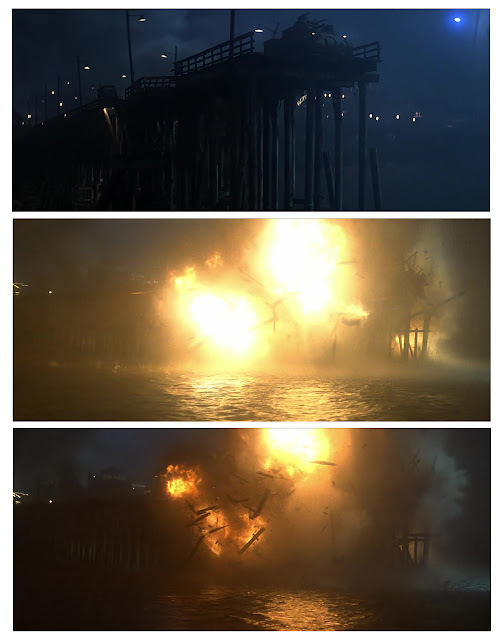 One of the rare lousy fx shots is this awful washed out process shot from the deck of the sub. I wonder whether front projection was used as I've seen a pic of what appeared to be a Scotchlite process set up behind the sub set. Lulubelle takes on the Japanese single handedly! Lulubelle takes a direct hit.... great pyro here. Don't worry folks, nobody dies nor gets hurt in this flick! As part of the wrap up, the sub takes on Ned Beatty's house. Blue screen composite with either the miniature sub or maybe a painted sub matted in?